LIGO: Einstein's gravitational waves or sound carried by light from cosmic dust? PITTSBURGH - Feb. 17, 2016 - PRLog -- . Physicists based on LIGO measurements have claimed  to have confirmed the existence of gravitational waves predicted a century ago as part of Einstein's general theory of relativity. LIGO stands for Laser Interferometer Gravitational-wave Observatory. In September 2015, LIGO sensed the collisional coalescence of two black holes called GW150914 as shown in the thumbnail. Over 0.2 s, the signal increases in frequency and amplitude from 35 to 250 Hz coming to a halt in the ring down. The most plausible explanation for GW150914 was thought to be gravitational emission from the inward-spiral of two orbiting masses. The Kepler effective black hole separation is given by the Schwarzschild radius Rs = 2GM/c2 and the post-Newtonian effective relative velocity v given by v = (GMπf)1/3 where f is the gravitational-wave frequency. The sound heard by LIGO for GW150914 may have nothing to do with the gravitational wave created in the collisional coalescence of the black hole pair as the low redshift Z = 0.09 reported is not consistent with their relative Newtonian effective velocity of 0.5 c. Indeed, it is only conjecture that the collapse of the Kepler effective black hole separation is the mechanism for producing the sound heard in LIGO as measurements of redshift in the collision cannot be made. Sound from the black hole collision is proposed carried through space and time by light emitted from NPs in the trailing debris of the black hole pair. NPs stand for nanoparticles. The proposal is an extension of the photophone developed  by Alexander Graham Bell in 1880. Indeed, Bell in 1916 when Einstein proposed his theory of relativity could have, but did not claim sound in gravitational waves is carried by amplitude modulated light. Unlike Einstein’s gravitational waves which are still questioned today, Bell’s theory of sound carried by light was experimentally confirmed over a century ago. In 1880, Bell could not have envisioned that NPs in the intense heat produced in coalescing black holes do not increase in temperature as Planck did not formulate his QM until 1900, i.e., the Planck law precluding atoms in NPs under high EM confinement from having the heat capacity to increase in temperature. QM stands for quantum mechanics and EM for electromagnetic. Today, we know heat is conserved in NPs by QED inducing the creation of light within the NP prior to being emitted to the surroundings. QED stands for quantum electrodynamics. However, the QED of light-matter interaction in the creation of light in NPs is far simpler than the complex QED theory advanced by Feynman, yet today is generally applicable to heat transfer in nanotechnology. Briefly stated: Under the QM restriction that heat capacity of the atom vanishes at the nanoscale, heat supplied to a QM box having refractive index n and sides d is conserved by creating standing EM radiation having wavelength λ = 2 nd. But because of the high surface-to-volume ratio of NPs, absorbed heat is deposited almost totally in their surfaces thereby providing the momentary EM confinement necessary to create standing EM radiation. Since the created EM radiation is formed from the surface heat, the EM confinement vanishes allowing the standing EM radiation to promptly escape to the surroundings. See diverse QED applications at http://www.nanoqed.org, 2010-2016. In application, Bell used a selenium crystal - a solar cell - to convert modulated light to electrical signals that produced sound in a speaker. The LIGO detector differs by measuring the motion of a pair of test masses suspended on vibration isolators in each arm of the 4 km long tubes. But the sensitivity of LIGO to 0.2 s of Bell's sound modulated light which also may be present is not reported. However, the LIGO transmitter is thought to be the emissions of gravitational waves from the masses of black holes. But QED induced light from heated NPs is modulated by the actual sound produced in the black hole collision. Hence, the wavelength of QED induced light that depends on the dimensions of the NP is modulated by its compression from the intense pressures produced in the black hole collision. The mechanism for the modulation of light by compression of the NP by sound is illustrated in the thumbnail. QED induced light from heated NPs in the trailing debris of colliding black holes provides a simple explanation of GFW150914. Assume the black hole pair are rotating on the Schwarzschild radius Rs = 2GM/c2. For M =70 solar masses, M = 1.39 x 1032 kg and Rs = 2.03 x 105 m. Taking the tangential velocity V = 0.5 c, the sound frequency f inferred from the light produced in the NPs in the trailing debris of both black holes ( 2 times / revolution ) is, f = 2 V / (2 πRs ) = 235 Hz which is consistent with the peak 250 Hz of LIGO response in the thumbnail. Unlike ring down, QED induced light abruptly halts upon coalescence because the trailing debris of the black holes containing NPs abruptly ceases. 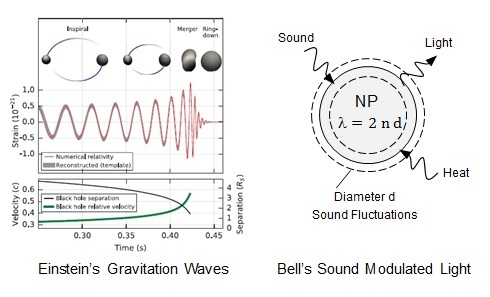 LIGO may not be the confirmation of Einstein’s theory of gravitation as Bell’s theory of sound modulated light based on QED induced light from NPs is a far more convincing explanation of GW150914. Like the early evidence for gravitational waves by BICEP2 later revealed as cosmic dust rather than the Big Bang origin, LIGO may also be shown caused by cosmic dust. B. P. Abbot, et al., “Observation of Gravitational Waves from a Binary Black Hole Merger,” PRL 116, 061102, 2016. A. G. Bell, "On the Production and Reproduction of Speech by Light", American J. Science, October 1880, Vol. 20, 118, pp. 305–324.